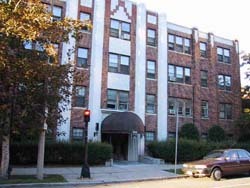 2045 Commonwealth Ave., Brighton is a nicely landscaped, four-floor brick apartment building on one of Boston’s most famous and scenic boulevards. 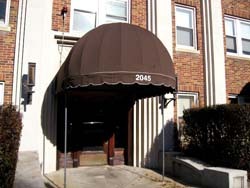 It occupies half a block on the north side of the avenue. 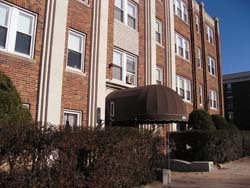 The 35 units are less handy than some to extensive shopping and other services, but a small commercial center at Lake Street, just a short walk away, provides basic retail outlets, and access to Boston’s famous trolleys is just a step outside the front door. The most significant neighborhood presence is Boston College, a 125-year-old Jesuit university that occupies several hundred acres between Beacon Street and Commonwealth Avenue in Brighton and Newton. The school’s 15,000 students give the area an active, cosmopolitan, creative atmosphere.